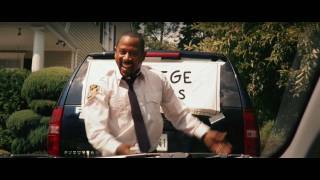 Directed by Roger Kumble (THE SWEETEST THING, JUST FRIENDS), the 2008 comedy COLLEGE ROAD TRIP stars Martin Lawrence as Chicago cop James Porter, an overprotective father who wants to keep his college-bound daughter, Melanie (Raven-Symone), close to home. When the smart, assertive Melanie declares her intention to attend Georgetown instead of Northwestern, James insistently sets out with her on a cross-country car journey to Washington D.C., hoping to dissuade her along the way. En route, of course, plenty of hijinks ensue, including scenarios involving a precocious pig and, oddly enough, Donny Osmond, who turns up as an eeriely cheery dad also on a college-touring campaign. With its broad, slapstick humor and enegetic leads, COLLEGE ROAD TRIP is a perfect vehicle for Lawrence and Raven, who both play to their well-established personas--the former a cranky bumbler, the latter a headstrong teen. Osmond, in his first film role in decades, ideally embodies Ned Flanders-like enthusiasm, stealing plenty of scenes with the aid of his equally giddy on-screen offspring (Molly Ephraim). Although it's far from high-minded cinema, TRIP is a fun, family-oriented road movie that easily appeals to a wide audience, and offers up many silly and appalling moments of parental embarrassment.